With a website that gets 4 billion views each day, YouTube offers advertisers a vast platform to reach users. It has become one of the largest medium for advertisers who want to form a lasting relationship with their customers, generate leads or simply create awareness about their brand. YouTube has provided businesses a great platform to not just spread the word but also effectively market their products and utilize the visual medium to connect with their target audience. 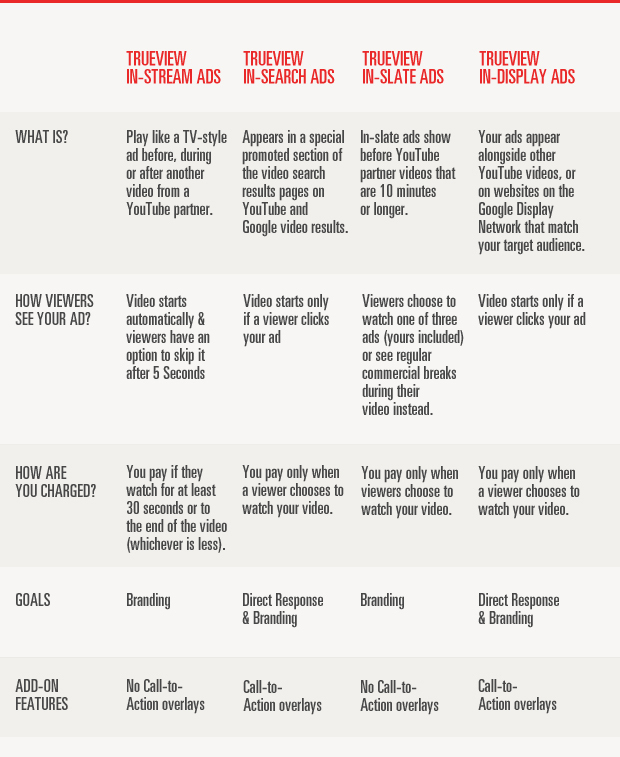 Advertisers looking to use video ads for promoting their brands on YouTube and Google Display Network can utilize the following two options available: AdWords for Video and Display Ad Builder. We will be taking up AdWords for Video in this article. AdWords for Video uses a Cost – Per – View (CPV) pricing model, which means that you pay only when someone watches your video – Complete Value for money! You have the advantage of both sight and sound which if used optimally could result in leads and sales. This feature only supports the TrueView Ad Formats and requires that the videos to be used in the ads be hosted on YouTube. 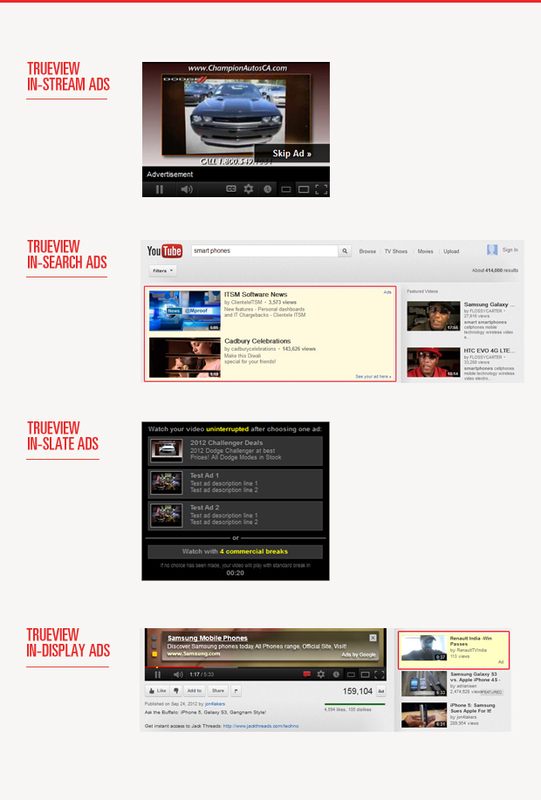 TrueView Ads include four different ad formats that you can use to display your ads. *Know more about Call-to-Action overlays here. Now that you are familiar with the ad formats, just log into AdWords for Video and get started. Here are some tips that may help you in creating an effective video ad campaign. Make videos that entertain and educate your viewer. They should be relevant to the viewers watching it, encouraging them to take action. The core message of your ad should be delivered within the first 5-10 seconds of the video. According to statistics, viewers tend to lose interest after 45 seconds, so the video should be kept as short as possible. Choose an appropriate thumbnail for your video and create promotional text that matches the thumbnail and the context of your ad. Also, your video should not be completely focused on selling your product. Try and form a personal connection with the viewer as well. Enable Call-to-Action Overlays to drive traffic to your website. Have a clear call to action message within your ad so that the user knows what steps to take and what to do after the video is finished. The image and sound quality of the video should be excellent so that the users get a rich experience. You can use negative keywords to filter out the unwanted audience. 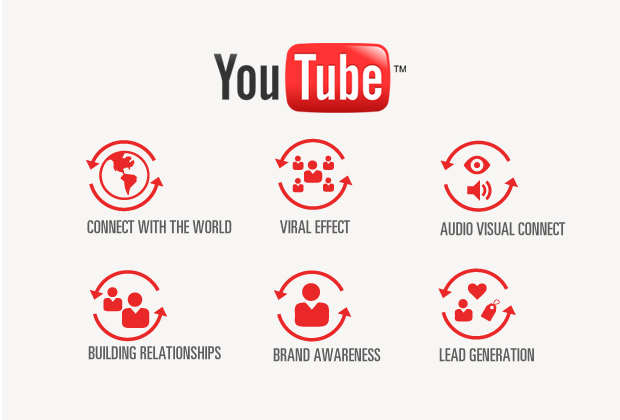 YouTube video ads can convey your message in a very effective and retainable manner. CueBlocks can help you with your video advertising strategy, execution and the entire process. Get in touch with us here.